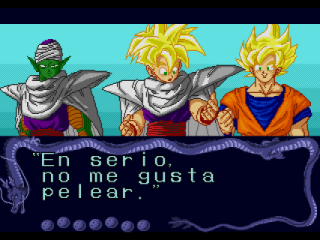 Dragon Ball Z: Buyuu Retsuden is an action fighting game for the Sega Genesis. 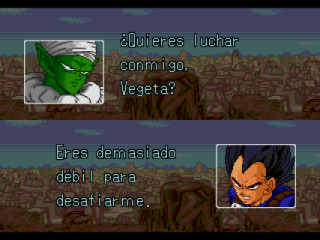 Based on a manga/anime of Dragon Ball Z.
There’s a story mode in which you use any of the game’s eleven fighters, and depending on who you choose, the battle order will be different and you will not face two characters. 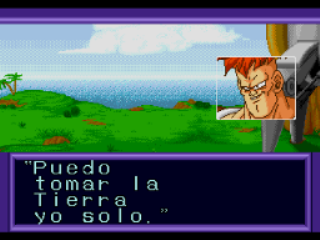 When the two fighters start getting far from each other, the screen splits, but you can track just how close you are to the other fighter by using the map below your energy / ki meters [all these three have been present in the Super Famicom DBZ games as well]. 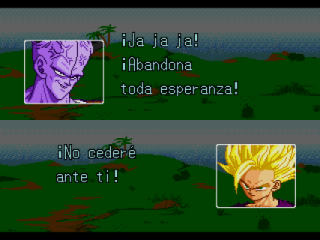 Translation to Spanish for “Dragon Ball Z: L’Appel du Destin”, for the Sega Mega Drive/Genesis.